To properly counsel and treat people diagnosed with neurodevelopmental and cognitive disorders such as schizophrenia and autism, a research team calls attention to the importance of assessing the possible impact of rare DNA variations in the “genetic background” which may interact with primary, causal DNA mutations. 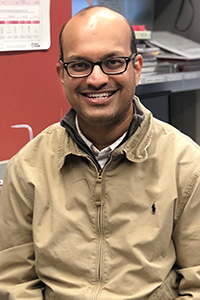 Among those trying to discover revealing patterns in a massive quantity of genome data is a research team led by 2014 BBRF Young Investigator Santhosh Girirajan, Ph.D., of Pennsylvania State University. Publishing recent results in the journal Genetics in Medicine, the team is calling attention to the interaction of well-known “primary” DNA variants—genetic disruptions that are uncommon but have been seen repeatedly in people with schizophrenia and autism—and “secondary,” very rare variants scattered across the rest of the genome. The team sheds new light on how those secondary DNA changes—part of what scientists call “the genetic background”—interact with primary variants, sometimes influencing the severity of the illness or the symptoms particular patients will experience. Dr. Girirajan and colleagues pored over genetic and clinical data collected from a total of 757 individuals with neurodevelopmental and cognitive disorders such as schizophrenia and autism, comparing them with matched information from 233 parents and siblings of the same patients, who also carry primary DNA variants linked to neurodevelopmental and cognitive illness. These family members are either disease-free or have mild clinical symptoms, a fact which reminds us that merely having a particular DNA variation does not necessarily mean that someone will become ill.
One question the new research explored: in patients sharing the same primary, potentially causal DNA disruption, what is the impact of the rest of the genome—the genetic background—upon differences in their symptoms? The team concluded that in different people having the same DNA variant, the variability and severity of neurodevelopmental and cognitive illness correlates with how many rare variants each such person has in their genetic background.